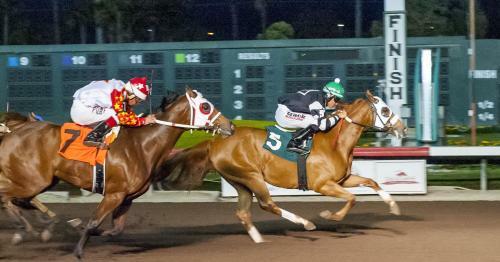 Just like in 2018, the first two races for 2-year-olds of the current Quarter Horse meet at Los Alamitos went to horses owned by Reliance Ranches LLC and trained by Mike Robbins. The Oklahoma-based operation won the season’s first two races for juveniles here on Friday night after Dreams Divine and Invader posted convincing victories in their respective debuts. It was a similar start for Reliance Ranches and Robbins to the one they enjoyed last year when Conquering Marie and SC Coronada won the juvenile division’s first two races at Los Alamitos. Dreams Divine, a filly by Apollitical Jess and out of the stakes winning mare Answer The Dream, ran lights out in her debut, as she broke sharply from post number five on the way to a half-length victory in a 300-yard time of :15.723. Two races later, the Tres Seis gelding Invader scored a ¾ length vin in a time of :15.727. Making his first riding appearance ever at Los Alamitos, 19-year-old jockey Ruben Castro piloted both Dreams Divine and Invader to victories. Robbins was happy to see the young pilot enjoy a successful evening.